So how do you spend your vacation? David and I have started a tradition of "Sculpture Week" each year. It started in 2009 with the regular "What should we do on vacation this year?" discussion. 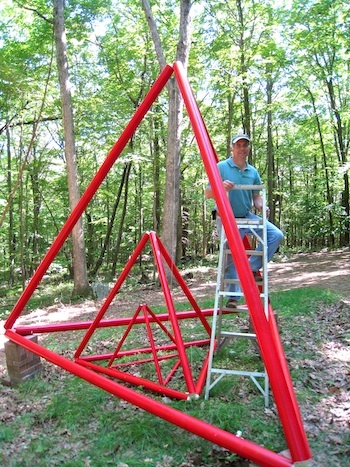 We decided to stay home, do no regular work, but instead collaborate on a large, outdoor sculpture. 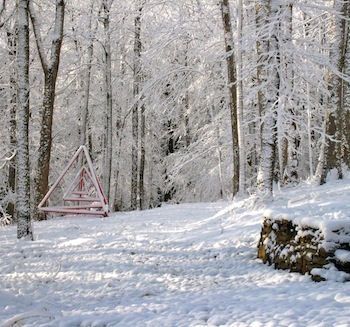 We have a dream of sculptures scattered throughout our woods but outdoor sculptures are EXPENSIVE. Our solution is to create our own. 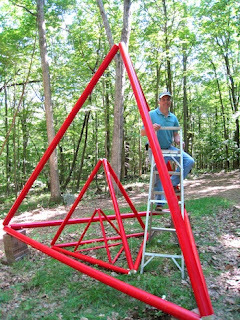 Now, in 2011 we are in the midst of our third Sculpture Week. Before I start sharing with you the absolutely zany photos from this year, I thought it informative to give a historical overview. Today is about the very first Sculpture Week in July of 2009. That year we decided to build a geometrical sculpture based on three tetrahedrons. 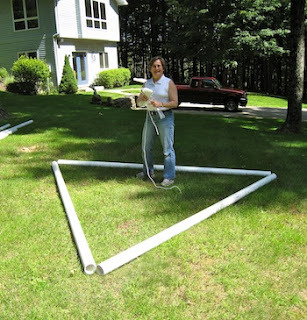 We purchased PVC piping in three diameters and laid out triangles. As a kid I had made straw sculptures stringing pieces of plastic straws together. My thought was to approach this the same way. We ran nylon parachute cord through the pipes and tied them off. This was the first lesson in what has become a Sculpture Week theme - flexibility! Things don't always work as planned and we need to reevaluate, problem solve and adjust along the way. We ended up drilling holes and twisting wire at the ends to get the degree of rigidity desired. 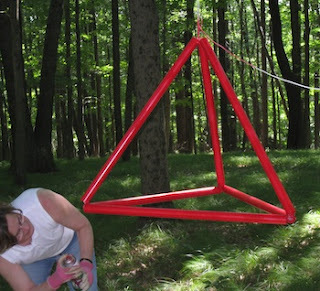 After creating the three tetrahedrons we hung them from trees and spray painted them with paint designed for plastic lawn furniture. 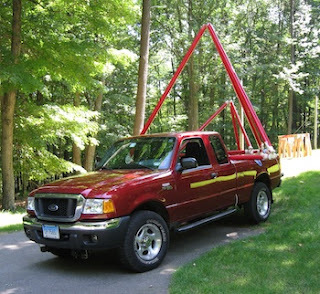 All pieces were loaded in the back of the pick-up truck and driven closer to the install location. It was a strange site going down the road- but our neighbors are used to strange sites on our property! We chose a spot visible from the house but not part of our lawns or garden area. We are expanding the area that is visually defined as established and not just "the woods." 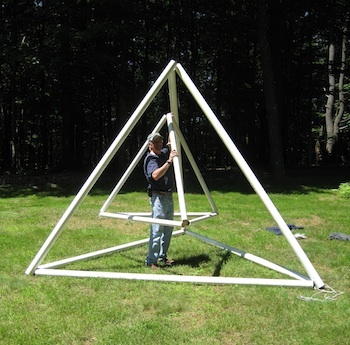 The two center tetrahedrons were suspended and can turn freely within the larger tetrahedron. The largest is balanced on brick piers that blend into the surroundings. It looks like it is suspended in space about two feet off the ground. Final assessment? We love it. In all types of weather! And we loved Sculpture Week. Return for the report on 2010. 2011 is in progress right now and I'll report in - with pictures - once complete! I love your site. I was attracted here by the red tetrahedrons, but I've been exploring and I love it all! Please let me know the length of each side of each of the tetrahedrons. How has the paint held up to the elements? Remarkably well. We have kept some of the spray paint and do little touch ups each year. This year it could use a bath as well - but it has been out for 5 years! I just found your blog site and I find it very interesting, inspiring, and lots of fun!